Quebec City police said 44 people were arrested near the site of rival protests by right-wing and anti-fascist groups, according to police spokesman André Turcotte. These included a first group of 21 individuals who were arrested early in the afternoon for “plotting to counter the protest” that had been organized by right wing groups, he said. “Weapons were found: telescopic sticks, slingshots, bottles containing a liquid that is for the moment unknown, and in addition their faces were covered,” he said. The suspects were questioned and could face charges of conspiracy for unlawful assembly and wearing disguise for a dangerous purpose, he added. Another 23 people associated with the counter protest were arrested later after they failed to disperse, Turcotte said. Police say about 1,000 people participated in the two demonstrations. 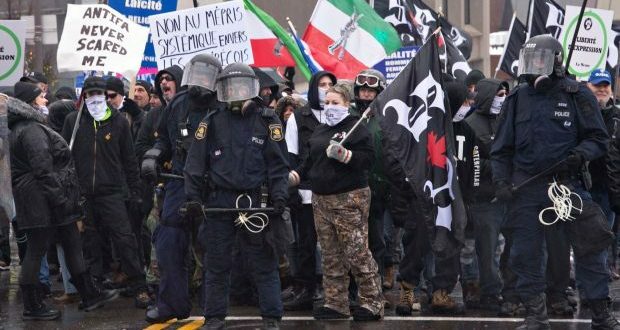 The arrests came after several hundred members of the right wing groups Storm Alliance and La Meute gathered to march through downtown Quebec City.